Here's an interesting slide that was shown. Newell was the head of the Phoenix office. The recipient, Kevin O'Reilly, is the White House's National Security Director for North America. Some interesting segments from the transcript are in extended remarks, below. The witnesses were Carlos Canino, Acting Attache To Mexico For The Bureau Of Alcohol, Tobacco, Firearms And Explosives, Darren Gil, Former Attache To Mexico For The Bureau Of Alcohol, Tobacco, Firearms And Explosives. Jose Wall, Atf Senior Special Agent, Tijuana, Mexico. Lorren Leadmon, ATF Intelligence Operations Specialist, William Newell, Former Atf Special Agent In Charge Of The Phoenix Field Division, William Mcmahon, Deputy Assistant ATF Director, field Operations West. Agent Gil: During dissertation research I came across a study titled "The Waco Texas ATF Raid and Challenger Launch Decision, The Management, Decision and Knowledge Analytic." The papers title could have been substituted "Operation Fast and Furious" for Waco Texas ATF Raid and the conclusions would have been the same. Namely poor management, poor judgment and poor leadership resulted in disaster. Operation Fast and Furious is indeed a disaster. I'm here today to answer the committee's questions, but I also have a few questions of my own. For example; who actually presented this operation for implementation? What was the objective? My staff was already working with Mexico in tracing thousands of firearms recovered from crime scenes. Why the need to introduce even more firearms into a country that's seized by narco violence? 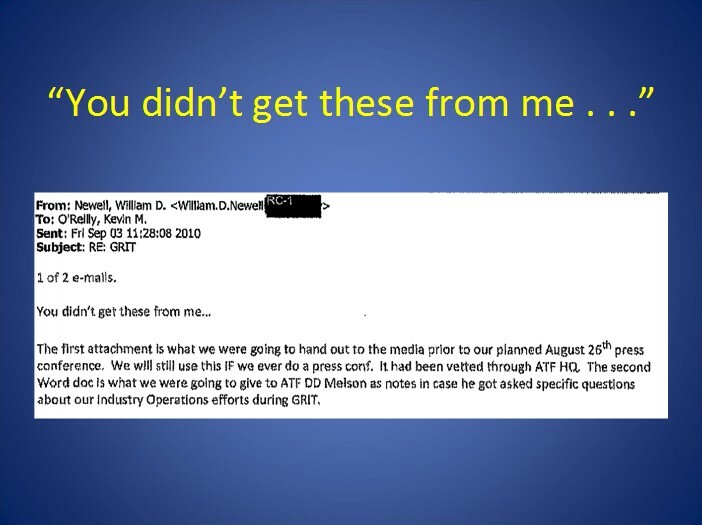 Agent Wall: I could not believe that someone in ATF would so callously let firearms wind up in the hands of criminals. But it appears that I was wrong that hundreds and quite possibly thousands of guns have been allowed to reach the hands of organized crime in Mexico. And that this activity has seemingly been approved by our own Justice Department and ATF management in the misguided hope of catching the big fish. Having had enough experience with drug trafficking investigations, I can only imagine that once the DOJ/IOG report was released a report that was critical of ATF efforts in stopping gun trafficking the emphasis changed to following the food chain up to the leaders. Agent Canino: In my professional opinion, this investigative strategy was flawed. It was allowed to continue due to ineffective oversight in the Phoenix field division, and possibly beyond. It's alleged that over 2,000 guns were trafficked in this investigation. To put that in context, upon information and belief, the U.S. Army 75th Ranger regiment has approximately 2,500 Rangers. That means that, as a result of this investigation, the Sinaloa cartel might have received almost as many guns that are needed to arm the entire regiment. I would like to inform this committee and the American public that I believe what happened here was inexcusable, and we in Mexico had no part in it. We were aware of this investigation, but we were never aware of the policy to walk guns in this investigation. Agent Leadmon: In December 2009 I began to the beginning of March 2010, I conducted numerous briefings on the investigation with the ATF senior management staff and headquarters. During each briefing, I provided detailed information to picking the progression the acquisition of firearms and described the location, number, type and identify of the purchaser for each firearm recovered. I provided the briefing to acting director, the acting director in the first part of 2009 concerning firearms trafficking to Mexico, in which he was briefed on the upstart of the Fast and Furious investigation. He later attended one of the field operations briefing in the first part of January. In March 2010, I conducted a video conference briefing with the managing officials from the four ATF Border Divisions, an attorney from the Department of Justice, and every one of the ATF senior management staff, except for the acting director. BURTON: Who does who came up with this idea? Was it you or Mr. McMahon or somebody higher up the food chain? NEWELL: Idea for what, sir? BURTON: For the whole program. NEWELL: It's it's one of investigation, sir. Fast and Furious is one investigation. BURTON: Well, and who where where was I mean, the selling of the guns or the giving of the guns in Fast and Furious, where did that come from? Who made that decision? CHAFFETZ: But in January coming out of your office in a January 2010 I mean you you testified today in your opening statement; "It is not the purpose of the investigation to permit the transportation of firearms into Mexico." That's today. CHAFFETZ: Yet, in February or March I'm sorry January 8, 2010, it in this memo point number 13 you write or it is written; "currently our strategy is to allow the transfer of firearms to continue to take place." Albeit at a much slower pace in order to further the investigation, allow for the identification of additional co conspirators. It would continue to operate in illegally trafficked firearms to Mexico drug trafficking organizations. So it was the goal. It was the intention of the program to allow guns to be trafficked to Mexico based on this memo. Is that correct? CHAFFETZ: What what's wrong that's from your statement. It also says in here, a number of different seizures in Mexico. It seems very inconsistent at best to suggest that it was not the purpose to allow them to go to Mexico. Yet you know in 2009 that they're going to Mexico and you put it in a memo in 2010 January of 2010. How are those statements compatible? NEWELL: Well, Sir if I may and I'm and I'm glad I'm given the opportunity to clarify that paragraph that has been obviously well publicized. The wording in that the way my understanding was when that briefing paper was drafted was that our efforts to allow the transfer to identify additional co conspirators was so that we could further the investigation, take out the whole organization. CHAFFETZ: So you allowed is it hundreds or thousands of weapons to continue to flow through this program and go into Mexico? NEWELL: I'm sorry, can you repeat the question, Sir? CHAFFETZ: How many additional how many hundreds or thousands of weapons did you allow to be purchased knowing that they were going to Mexico? CHAFFETZ: But you facilitated it. You allowed it, did you not? You were a part of the program. Allow these straw purchases to happen so that the guns could end up in Mexico? And you know in 2009, that that's happening. NEWELL: Sir, again the goal of the organization the goal of the investigation was to disrupt and dismantle the entire ... CHAFFETZ: I know I understand the goal but you were purposely allowing the problem is you were purposely knowingly allowing the guns to go to Mexico. And you have information in 2009 that it's being successful. Yet you never put a stop to it. It's meeting the goals and intentions you laid out in this memo in January of 2010 and it continued on and on. And consequently there were thousands of weapons that ended up in Mexico killing people killing people. That's the reason that we're here today. When did you first know or think that guns were walking? NEWELL: Sir, in this investigation to the best of my knowledge we didn't let guns walk from that perspective. CHAFFETZ: When did you first think that they were? CHAFFETZ: Did you ever have you ever thought that they were walking? NEWELL: Sir, the policy regarding transfer of firearms regards the fact that we're trying to develop an investigation. CHAFFETZ: I know what you're trying, when did you first think that guns were walking? CHAFFETZ: I ... when did you first think that guns were walking? Did you ever think that? Did you think that here today? NEWELL: I truly believe as I have said before that I didn't we didn't let intentionally let guns walk. CHAFFETZ: Lets go to slide two if we could, please. This is an email from Mr. Newell to Mr. McMahon on December 21, 2010. Six days after Brian Terry was killed. Quote, "Since I don't like the perception that we allowed guns to walk, I had David Voss pull the numbers of the guns recovered in Mexico as well as those we had a direct role in taking off here in the U.S."
So you tell me you you didn't suspect that the guns were walking? NEWELL: As my email says, it's about the perception. There is there was I didn't want people to think there was the perception because in my mind that was not the case. CHAFFETZ: How were guns not walking? GOWDY: Well, let's do it another way. The very first weapon recovered in Mexico, through a trace, did you go back to the purchaser of that weapon and interrogate them? NEWELL: I did not, no, sir. NEWELL: I don't know, sir. MEEHAN: Mr. Newell, the strategy Mr. McMahon identifies that you expect, you understand, that he expects $70,000 worth of weapons. Where does that get in that there was no part in the strategy to allow guns to be taken to Mexico? MEEHAN: That's not my question about who the plaza boss was. The question is, is there a plaza boss? Agent McMahon just said he's in Mexico. MEEHAN: And the plaza boss expects $70,000 worth of guns. Now, you're saying no part of this strategy was to allow the guns to go into Mexico? Who's right here? NEWELL: Sir, the strategy wasn't to allow guns to go to Mexico. GOWDY: Let me ask you this. When you begin a sentence, "You didn't get this from me..." what does that mean to you? NEWELL: Just means that didn't get it from me. NEWELL: Well, obviously Mr. O'Reilly (ph) was a friend of mine and it's .. it's ... I shouldn't have been sending him that, obviously, I recognize that, it being a friend. GOWDY: But what do you mean, "You didn't get this from me..."? Does that mean you should not have been talking to him about it? NEWELL: Not that I shouldn't have been talking about. He's a friend of mine. He asked for information and I provided it to him. GOWDY: Well, then, why wasn't it appropriate for you to give it to him? Why would you preface it by saying, "You didn't get this from me..."? Was it an improper communication? NEWELL: No, it wasn't an improper communication. GOWDY: Well, then, why would you preface it by that? NEWELL: It's ... he's been a friend of mine for a long time and he asked me for information. So I gave him information that it's probably an improper use of the term or phrase. "Walking guns? You keep using tha' word...I do no theenk it means wha' you theenk it means..."
What a bunch of clowns...they know they've been caught in a lie, it shows in their speech patterns. He needs to be restricted to yes or no answers, until he has a choice between admitting his crime, perjuring himself, or taking the fifth.